Why not try something different as your vegetarian option this Christmas. Heritage carrots are very much in fashion. They consist of a mix of different varieties, and come in white, yellow, purple and of course our everyday orange. Dukkah is originally from Egypt, in Arabic it means a spice mix that is pounded or lightly crushed. This is Executive Chef Ghani’s favourite spice mix. When made it keeps very well in a sealed jar and is a great spice mix that can be used to lighten up plain steamed rice or a topping for hummus. Start with the Dukkah, toast the nuts separately in the oven at 160C* for 10/15 minutes until golden. When cool crush them with the bottom of a pan on a flat surface, one punch/ crack is fine we don’t want them too crumbled. Gently toast the seeds in a dry pan at low heat for 20/30 seconds, add the turmeric and cook a further 20 seconds. You must be careful not to over toast the spices as they will become bitter. Add the cracked nuts to the spice mix, season with Maldon sea salt and let them cool. Wash and peel the carrots, then cut in quarters lengthwise and in six or 7 cm sticks. Carrots come in a range of sizes, so it is best to have them in similar sizes to ensure they cook at the same time. In a large pan sauté the yellow and regular carrots with a little olive oil, get some colour, add salt and cover with a lid for two minutes add a couple of spoons of water if needed. Repeat with the purple carrots separately. It is important that we don’t mix all of them yet or they will stain the other carrots.Remove the lid and prick with the knife to see if they are ready, they should still have a bite to them. Add the grated garlic, butter and a generous amount of Dukkah, toss for a minute, season again, and add the fresh coriander. 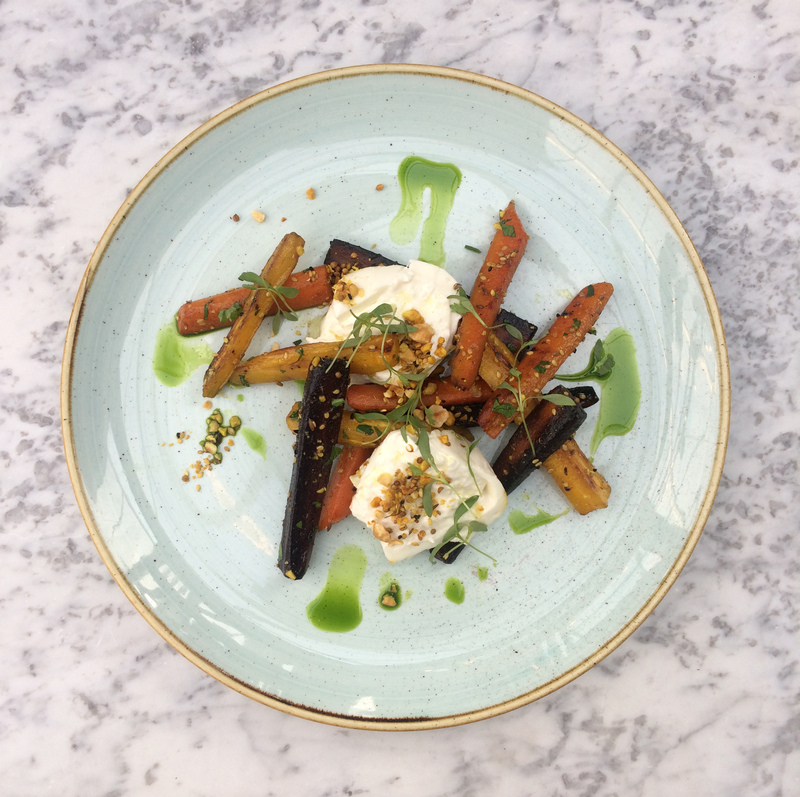 Tear the buratta into large chunks and place it on top of the carrot, drizzle with a generous amount of extra virgin olive oil, salt and pepper.